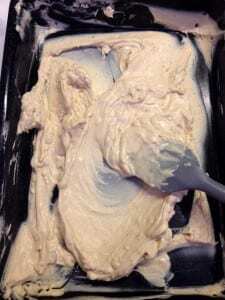 I can’t remember where exactly I first came across caramelised white chocolate but having heard of it needless to say it was something that I had to experiment with. 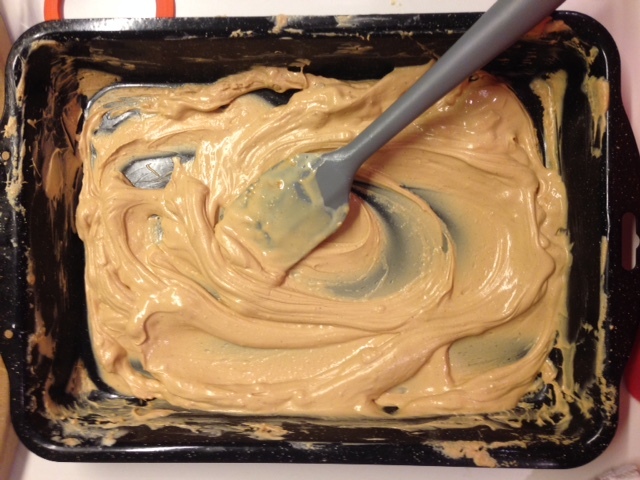 I mean the words alone: caramel, white chocolate, caramelised white chocolate…what could there be not to love! And my first batch did not disappoint! 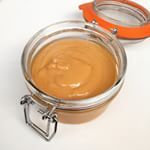 Unlike caramel or white chocolate itself which can have a sometimes over-sugary sweetness, the process of caramelising the chocolate creates a more delicate sweet flavour, rather like a silky and light dulce de leche. 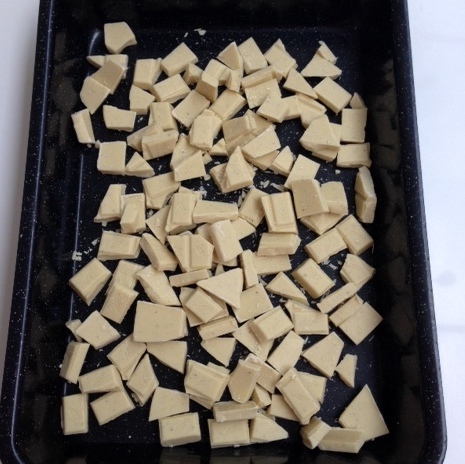 To make it requires little skill, just a little love and time to intermittently stir the white chocolate in the oven while it slowly caramelises. I used the method described by the acclaimed pastry chef, David Lebovitz. 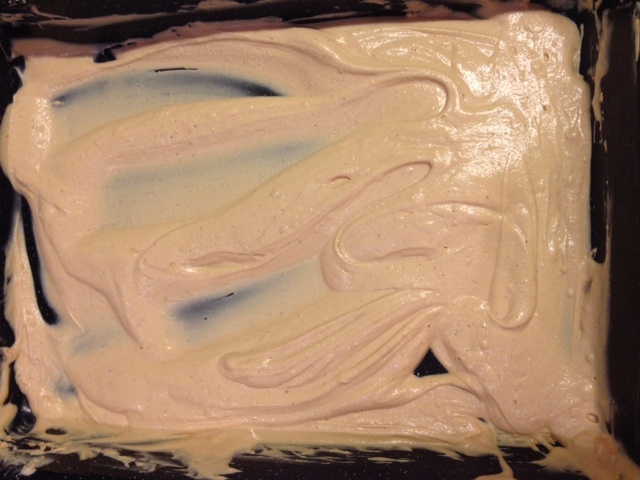 He recommends using Valrhona 34% white chocolate, but I have successfully caramelised Green and Black’s 30% white chocolate as this was all I had to hand on my first attempt. I do believe the key to this is to use the best quality white chocolate you can, with a minimum % cocoa butter of 30%. The other important factors are patience and perseverance. Slow cooking is required, and at some points the chocolate becomes lumpy, chalky and frankly quite disastrous looking, but if you continue to stir it it will smooth out (please see my quick iphone progress shots below). I used a low oven temperature and it took around 70 minutes to caramelise. You may wish to experiment with a slightly higher temperature if you wish to speed up the process. Also, ovens temperatures may vary so it is best to keep an eye on it and judge when it is done when it has turned a light brown colour, similar to caramel. It can be stored in sterilised jars so I make a batch that lasts me for several weeks. As it hardens it can look streaky but can readily be returned to a smooth caramel texture again by melting in the microwave or bain marie. 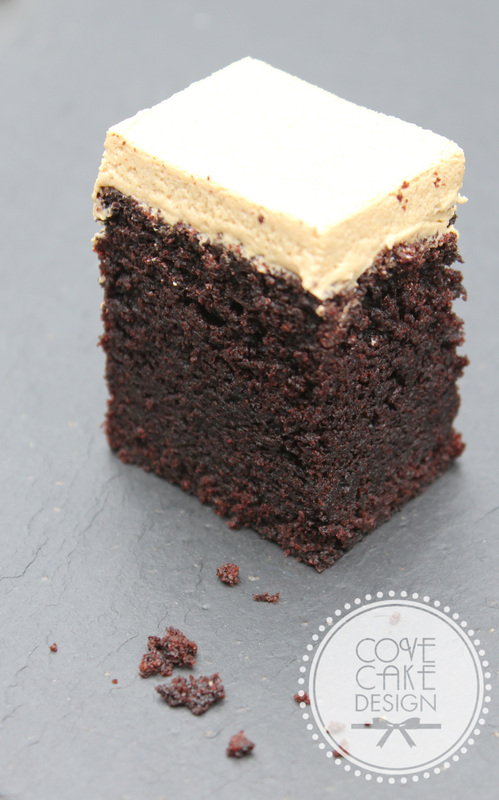 I use my caramelised white chocolate to flavour buttercream to pair with my Guinness Chocolate Cake, a divine combination! 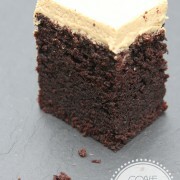 For this I simply add a few tablespoons of melted caramelised chocolate to my normal buttercream recipe to taste. 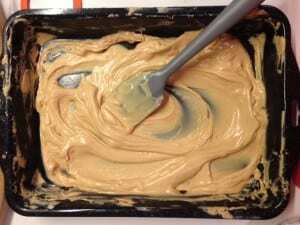 Although I haven’t tried other pairings I imagine it would work well in any situation where a caramel or dulce de leche flavour is called for. Alternatively, while contemplating possible flavour combinations feel free to savour the fruits of your labour with a spoon (!). Stir and return to oven. 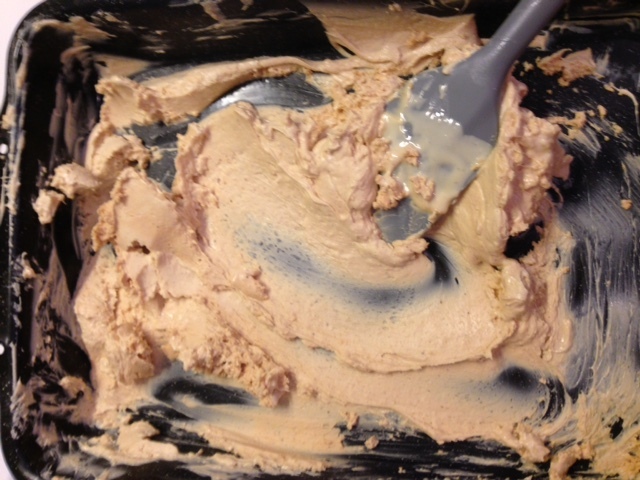 Continue checking and stirring every 10mins (persisting through the ugly chalky, lumpy phase!) until chocolate has turned a golden brown colour and is caramelised. Add a pinch of sea salt and stir. I am a huge fan of blackberries, not only for their flavour but also because of a sense of nostalgia associated with them. I have fond memories of scouring hedgerows as a child for wild blackberries every Autumn. Even today the sight of wild blackberries sends myself and the kids scrambling into brambles and ditches to collect a batch. Scratched legs and berry-smeared little faces (the kids, not me!) later, we head back to the kitchen for some baking! I always find it amazing how nature creates seasonal fruit that pairs so well together. A perfect example being apple and blackberry. Our local market begins to stock new season apples soon and to capture these two Irish fruits at their finest I wanted to share this recipe for apple and blackberry cupcakes. I make my own blackberry jam having discovered how easy it is after an over-zealous blackberry-collecting trip left us with so many blackberries we had no choice but to preserve some! Feel free to substitute some good quality local blackberry jam though. First, make the jam by placing all the ingredients in a large pot. Heat gently and stir until all the sugar dissolves. At this stage you can mash the blackberries if you do not want whole blackberries in your jam. Bring to the boil and boil (stirring occasionally to stop sticking) until setting point has been reached. You can test for setting point by removing your pot from the boil and placing a teaspoon of the jam on a cold plate in the fridge. The jam is set when a crinkly skin forms when you push it with your finger. 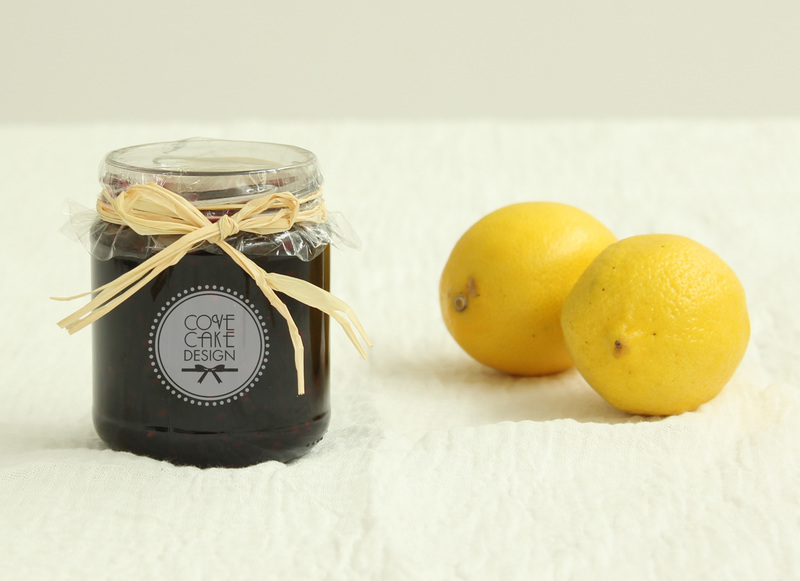 When setting point has been reached pour the jam into sterilised jars and seal immediately. Leave to set in a cool, dry place. 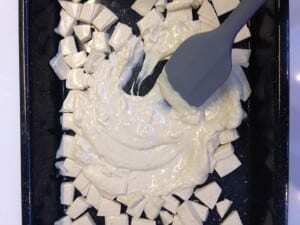 Beat the butter and sugar together with an electric food or handheld mixer until light and creamy. Beat in eggs one at a time (if mixture starts to curdle add a spoonful of flour). Sift flour, salt and spices together and fold into the butter mixture. 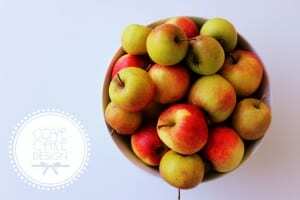 Finally fold in the grated apple. Spoon into cupcake cases and bake for approximately 20 mins until well risen and springy to touch. 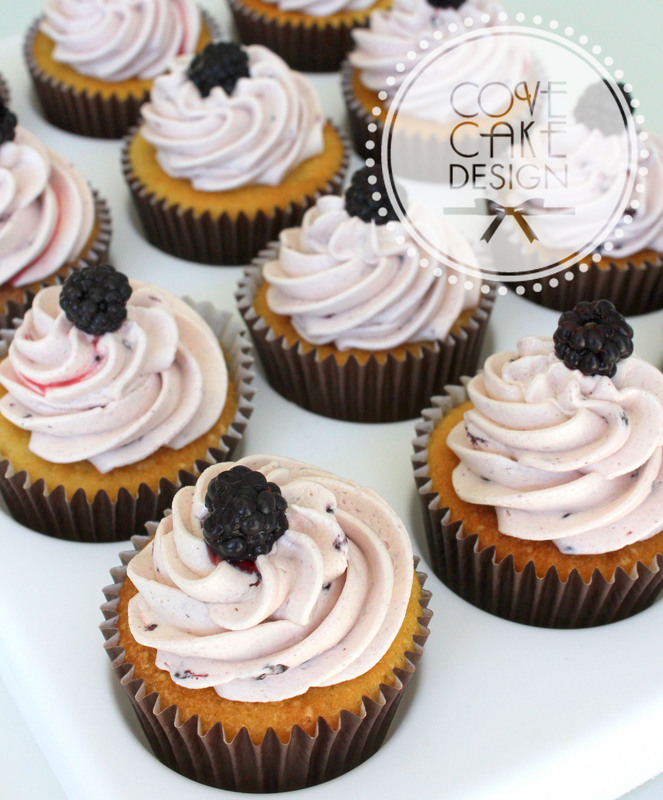 Optional: If you wish you can use a melon baller or teaspoon to remove the top of the cupcake and place a spoonful of your blackberry jam inside before icing. 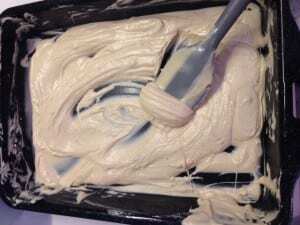 To make the icing, beat the butter until creamy. Add sifted icing sugar and beat for 5-10mins, scraping down the sides now and then. Finally beat in 2-3tbsp blackberry jam to taste. If you wish to have a seedless icing, sieve jam prior to adding to the buttercream. 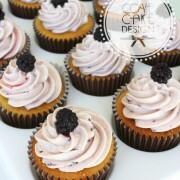 Pipe or spoon the buttercream over the cupcakes and decorate with a fresh blackberry if you wish! 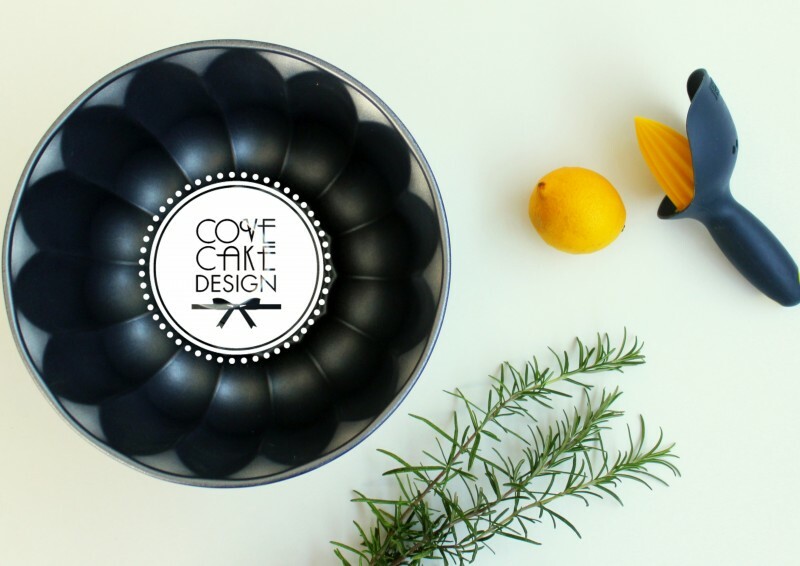 Welcome to Cove Cake Design’s new blog! Here I hope to give you a little insight into what drives me and my business by regularly sharing with you behind the scenes peeks at what’s happening at Cove Cake Design, as well as recipes, tips and guest blogs from industry friends. 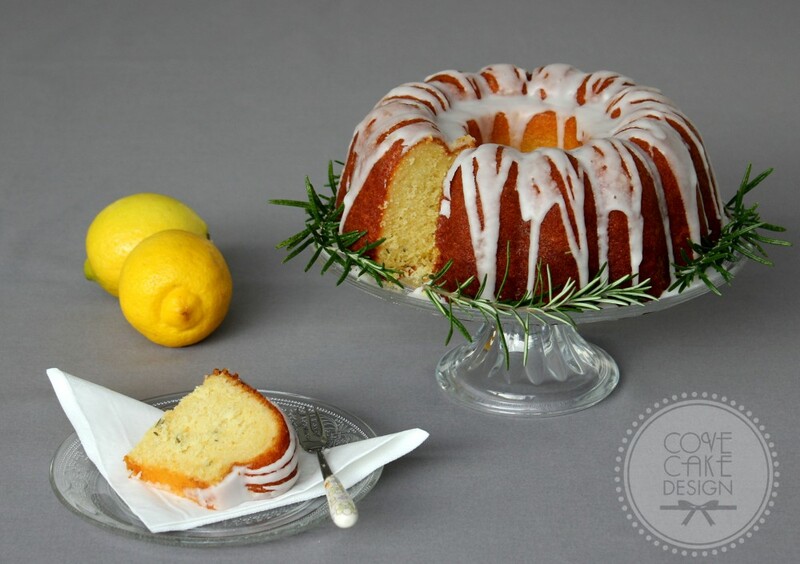 For my first post I am going back to what started me on this journey, a love of baking, by sharing with you an easy yet striking cake recipe, Lemon and Rosemary Bundt. The beauty of this cake defies its simplicity, making it perfect for even a novice baker who wants to make something a little special. It is dense, moist and cuts well, easily feeding a little crowd. Lemon is one of my favourite flavours and I paired it here with rosemary, mainly because my herb garden is a little wild at present and needed a little pruning, but also because savoury herbs such as rosemary and thyme work remarkably well together with the tang of lemon. 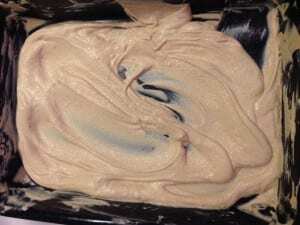 A bundt tin is a great investment for any cake-maker: they are actually quite beautiful in their own right and when you pop your cake out of the tin even without any decoration it looks magnificent. 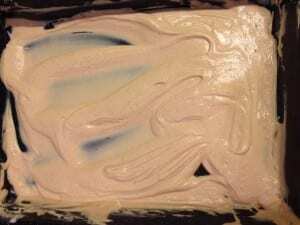 This recipe is adapted from a vanilla sponge recipe by Nigella Lawson and I have chosen to decorate the cake with a simple lemon icing, and in an attempt at some garden maintenance, a few sprigs of rosemary. Enjoy! Step 1: Preheat the oven to 160°C/320F/gas mark 3. Grease a 9” bundt tin very well with melted butter. Step 3: Cream butter, caster sugar, lemon zest and rosemary together in mixer until light and fluffy. Step 4: Beat in eggs one at a time, adding one tablespoon of flour with each egg. 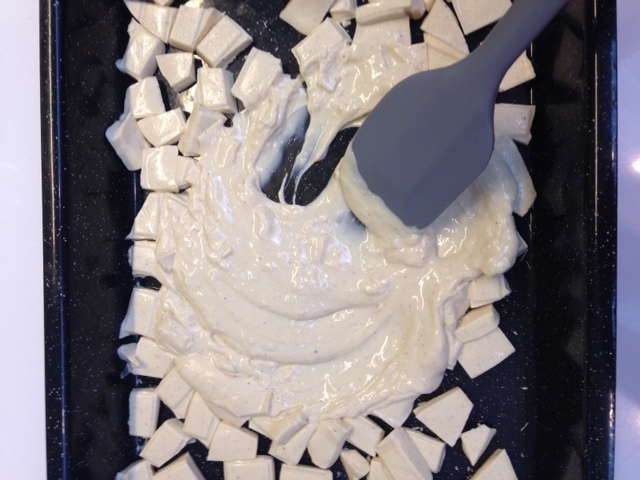 Step 5: Fold in remaining flour, followed by yogurt. 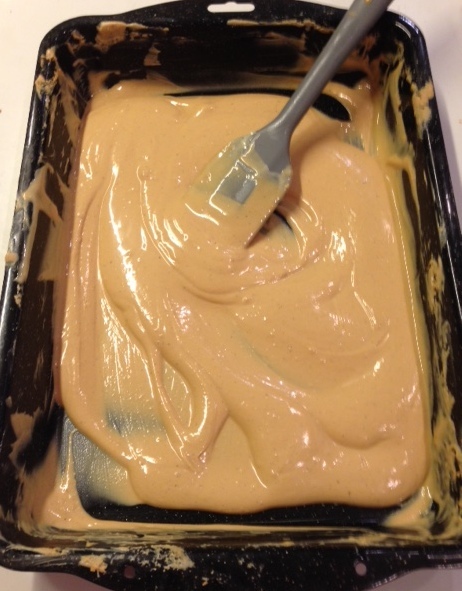 Step 6: Pour into greased bundt tin and bake for 45mins-1hour. Check after 45 mins. Cake is cooked when well risen, springy to touch and skewer comes out clean. Step 8: Meanwhile make the syrup by placing all the ingredients in a saucepan and heating gently until sugar has dissolved and syrup has reduced a little. Remove rosemary sprig. Step 7: When cooked, remove cake from oven and leave to cool for a few minutes before turning out onto wire rack. While still warm, pour syrup over cake and leave to cool. Step 9: Make the icing by adding lemon juice to icing sugar until consistency is such that it can drop off spoon. Drizzle over cake nonchalantly! Storage: This cake keeps well in an airtight container for 2-3 days.